This is the second edition of a book that I have previously reviewed. The 2003 edition is now showing its age and the new 2007 edition brings the material up to date in a fast-moving field – indeed over half of the material has been re-written. The sub-title is “A guide for business process managers and BPM and Six-sigma professionals” gives a clue to the changes in the four years since original edition. 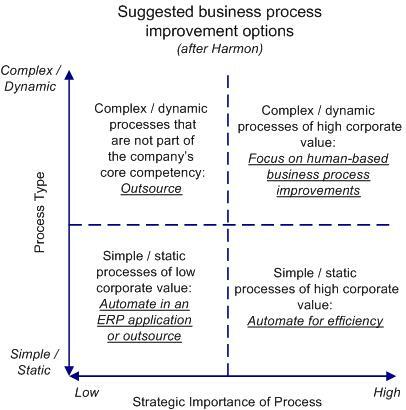 Interest in business process management and the popularity of implementation techniques such as Six-sigma and Lean, have increased markedly in the time-period and the new edition puts these practices into context of a wider business-change programme. The book describes three levels of business process change: enterprise, process and implementation techniques. Kaplan and Norton’s balanced scorecard approach. The author advises to aim to increase corporate competitiveness by process management and efficiency rather than simply outsourcing, or responding to competitor’s latest initiatives, or implementing an ERP vendor’s off-the-shelf software modules. Like the first edition, the author advises those contemplating large-scale process redesign to consider alignment with process management frameworks such as SCOR or project management frameworks such as those advocated by PMI. In addition, the book gives clear exposition of process management compared to functional management, and the combination of both to give matrix management. The author also gives details on how to handle outsourcing within the redesign process and how to run a business-change programme alongside an ERP software implementation. The modelling notation in the previous edition focussed on Rummler and Brache’s process map notation (devised to map Porter’s value chains). This edition uses the Business Process Modelling Notation (BPMN) diagrams, the new de-facto standard for modelling processes. Like their close cousins - UML activity diagrams - BPMN can be ferociously complex, but sticking to the basic notation allows practitioners to communicate with business people using diagrams that look very similar to Rummler and Brache’s original process maps – still the most efficient way to communicate process information. enablers: people assigned, technology and facilities to be used. These types of diagram have been around for some time in one format or another. It is derived from the software engineering-based IDEF function-box diagrams and, in a simpler form, from the familiar SIPOC [Supplier-Input-Process-Output-Customer] diagrams, used in value stream [value chain] analysis in Lean approaches. The book also describes a framework for business-change initiatives - the “BPTrends Process Architecture” method. This high-level approach is a useful guide for those undertaking such an initiative but those wanting guidance that is more detailed may wish to look at that of Jeston and Nellis. The implementation level section also covers modelling tools and Business Process Modelling Suites (BPMS). The former, used for documenting and storing business processes, are relatively mature. The latter, which extends this modelling capability to use workflow and execution engines, are relatively immature and the author rightly advises caution in the face of optimistic sales-talk. This book gives a thorough up-to-date survey of the business-change landscape - the author even gives a nod to recent OMG initiatives regarding business rules. The advice given is sensible and method- and technology-agnostic. The lists of future reading at the end of each chapter are comprehensive and although the case study is a little brief, it is illustrative. Overall, highly recommended, and worth buying even if the reader has the first edition.